If your crab is going naked or losing limbs, please check out the FAQ page to find out why. Hello! Welcome to HERMIT-CRABS.COM. My name is Christa Wilkin, and I've owned land hermit crabs for over 35 years. First things first -- congratulations on having made the decision to own pet land hermit crabs! Hermit crabs need a bit more care than generally assumed, but you'll find the results to be very rewarding! Here you’ll learn all about keeping pet land hermit crabs healthy. You’ll read about what kinds of food they like and don’t like, what they like to do at night while you’re asleep, and (very importantly) what do when your pet crab molts (sheds his skin). You'll also learn how to tell the difference between a male and female crab, and even how to tell the different species apart! It gets even better -- you'll read the very latest information in crab care, and check out all the links I use to purchase my hermit crabs the very best internet shopping has to offer them. And of course you’ll read about the Crab Conventions. 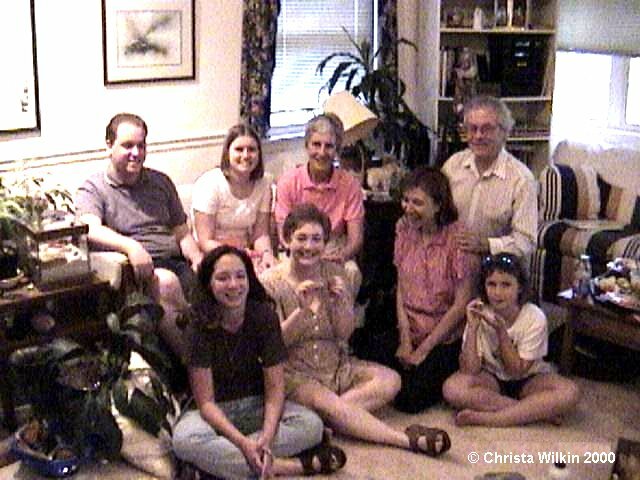 The first Convention was held in 2000 at my house in Alexandria, Virginia. About 10 people attended the first Convention (you can see eight of them in the picture on the left), and we had a wonderful time. We had conventions every year until I had my first child. After that it became too difficult for me to coordinate them. There is however a forum on the Hermit Crab Association where you can talk about setting up "Local Conventions" with people in your area. If you are a brand-new hermit crab owner and need to learn all the basics quickly , please start out at the Basic Care page and read it all. Then continue on to the FAQ Page, which will give you a little primer on most of the hermit crab emergencies that crab owners run into. Then read the Shells page and the Food page. After you know everything you need to know right away, you can take some time to read over the Molting page and other in-depth fascinating information about the various land hermit crab species and their behavior. If you have more questions after this, or want to become part of the large online hermit crab community, visit the Links page and get to know other hermit crab lovers from all over the world! If you are having a land hermit crab emergency, please check my FAQ page for emergency help. Got Crabs? The Hermit Crab Association is looking for people who are serious about hermit crabs. If you are tired of seeing hermit crabs treated as "throwaway animals," we're the group for you! The Hermit Crab Association promotes proper crab care in various ways, from handing our care sheets to posting reports of recommended pet stores throughout the world. We work on the principle that positive reinforcement is the best teacher. The Hermit Crab Association was founded in 2001 and has enjoyed many wonderful years of helping hermit crab lovers with their pets. Visit us today at HermitCrabAssociation.com.